This Mission Style twin over twin size bunk bed frame is made of solid pine wood with a dark cappuccino finish. 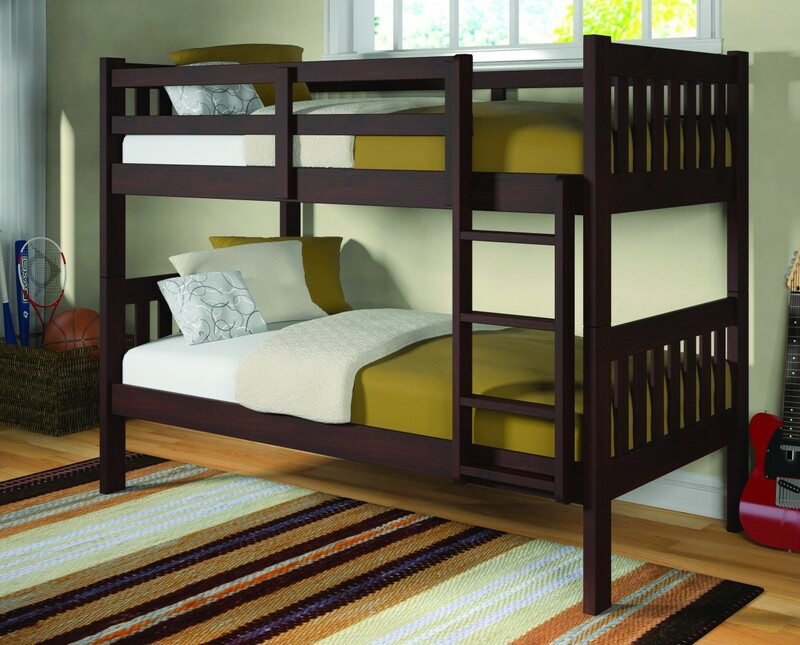 The frame includes the guard rails, ladder and bed slats. Optional Drawers and Trundle are available at additional cost. Please note that assembly is required. We include hardware and step-by-step instructions. Shipped to you directly from the manufacturer via UPS Ground or LTL Freight. Most orders ship out within 1-2 Business Days. The manufacturer warranties this product to be free of defects for a period of 90 days. The manufacturer, at its sole discretion, will repair or replace any parts that prove to be defective in materials or workmanship. The warranty applies only to the original purchaser and does not cover: (a) wear and tear; (b) damage caused by abuse or failure to follow care instructions.